The Sweratel RTWIP Heterogeneous network solutions provides complete end-to-end cost-effective infrastructure solutions riding the data tsunami heading their way delivering coverage and data-capacity demands in the most challenging areas such as urban, suburban, rural, logistics hubs, smart communities and networked connected society markets providing users with a truly complete mobility lifestyle. In today’s connected society, everything is becoming connected and considering the impact it has on education, communication, business, science, government, humanity etc, it clearly represents that the next evolution of the Internet is taking a huge leap in its ability to gather, analyze and distribute the data and turn into information, knowledge and wisdom. Instead, considering only the mobile users, it is predicted that the number of Mobile users (Smartphones, Phablets, Tablets etc) will surpass computer users the coming few years and applications such as HD streams, VoIP, Contents and “IoT” look set to inflate traffic volumes up to 1,000-fold by 2020. Rapid growth of Mobile Networks data traffic is a challenge for Operator’s to meet the customer demand of high data usage. Operators are slowly beginning to upgrade their 3G into LTE services. As access to technology increases, broadband data services/applications such as VoIP, HD video, Multimedia Contents etc are integrated into the same broadband networks drives the “Internet of Things” (IoT). The hope once envisioned for 3G and/or LTE as a true broadband service has all but dwindled away. To enable the highest quality experience for demanding mobile users (smart devices), the operators must limit the number of smart devices per cell in 3G and/or LTE networks and deploy additional 3G or LTE base-station to compete with high data demands of the mobile users. All this requires small cells and building-out conventional 3G or LTE base station towers is typically unaffordable. To overcome this cost effective approach of investing more capital on 3G and/or LTE networks, operators are looking for new and advanced approaches to ease the data traffic load on their existing infrastructure. 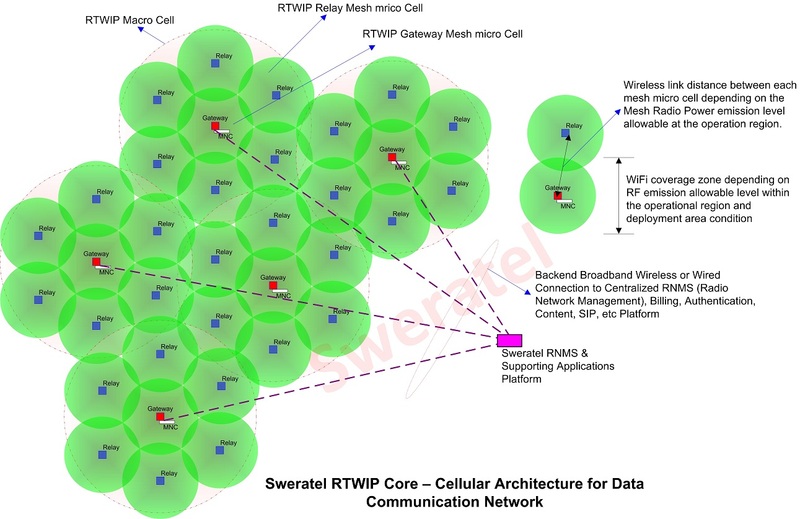 The Sweratel RTWIP Heterogeneous Network solution meet these requirements allowing operators to deploy a mix of technologies, 3G/LTE and Carrier-grade Wi-Fi networks with integrated mobile data offloading network architectures to optimally respond to rapid changes in customer demand and boost the user experience to peak levels. 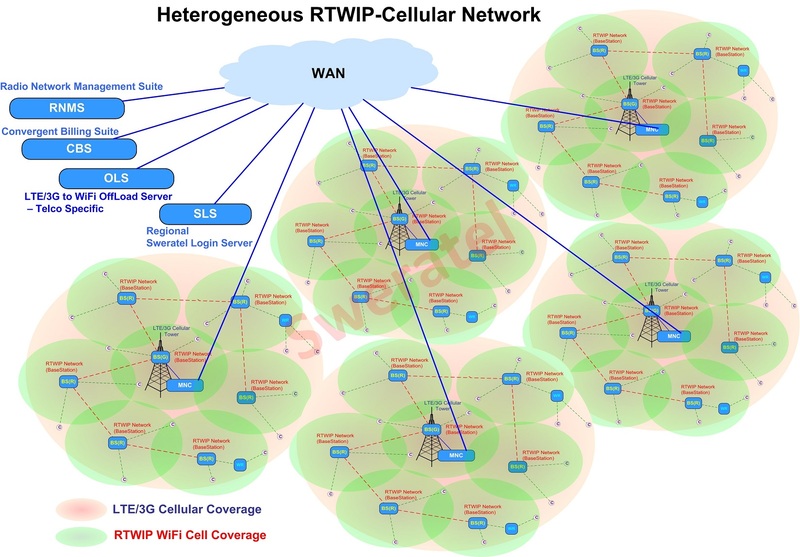 In other words, Sweratel RTWIP Heterogeneous Network Solution helps the clients to fast handoff between 3G/LTE or Wi-Fi networks while maintaining the performance and QoS at high-levels. The Sweratel Heterogeneous Network with integrated OLS provides a flexible and cost effective cloud-based mobile-data offloading solution and help operators to add coverage and capacity to existing macro networks and boost the user experience. Sweratel provides complete end-to-end and wide range of solutions that build into a unified MobileIP Heterogeneous Network solution, from small WiFi cell products with integrated OLS to unified RNMS and CBS platforms and iCoolness Social Media Engine Portal. The availability of such a solution will of course facilitate the establishment of new carrier-grade mobile WiFi operators, for example in Countries and Regions that still rely heavily on 2G networks and in rural areas with no landline infrastructure today but still a great demand for broadband access connections.